Male solo act. 1x75 minute or 2x45 minute sets. Can also appear with 4 to 12 piece live band. Recorded music during breaks. Leading Elvis tribute. Can perform either with playback or make “surprise” appearance with top live band. 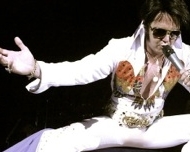 Suspiciously Elvis is recognised as one of the country’s leading Elvis tributes, and unlike most “playback” Elvises, this Elvis can also perform with a live band for a truly specatular show. For his one-man show, Suspiciously Elvis can perform up to two 45 minute sets or one 75 minute set on his own, and brings a small PA and lighting rig together with a playback system operated by a sound engineer. For a completely live set, he has teamed up with established covers band to present an unrivalled evening of rock and roll with the option of the band performing separate sets of 60s to 2000s music if requested. A usual routine sees the band playing a first set of rock and pop hits, then, out of the blue in the second set Elvis appears and sings all the greatest hits of the king of rock and roll. The band can then return for a third set if needed or you can see out the evening with Elvis. Members of the band are all highly experienced musicians and consist of a male lead singer/rhythm guitar, drums, bass and lead guitar/vocals. As a function band they usually play two one-hour sets or three 40-minute sets dressed in smart/casual dress but when working with Suspiciously Elvis they can perform up to a 90-minute set of Elvis songs within their performance time of two hours. Two appearances of note were when the band played in front of 22,000 people for the Millennium Fireworks Party in Ravenscourt Park, Hammersmith and at the reopening of Richard Branson's Kensington Roof Gardens. Background music can be provided free of charge and the band have their own excellent quality PA system and lighting rig. "I cannot thank you enough for arranging the most superb Elvis for our wedding! He couldn't have been kinder, more professional and a great entertainer." "Once again, thank you for supplying us with a really good act. Everyone who attended the evening thoroughly enjoyed it." "First class in every respect! Recommendations already made. ‘Elvis’ was fantastic!"